Book hotel rooms online with us at Real Marina Residence Hotel at the lowest rate, guaranteed. Get a holiday discount room rate at the 4 Star Real Marina Residences Apartments located in Albufeira in the Algarve. The complex has 80 self-catering one, two and three-bedroom apartments providing accommodation from three adults plus one child to seven adults plus one child. 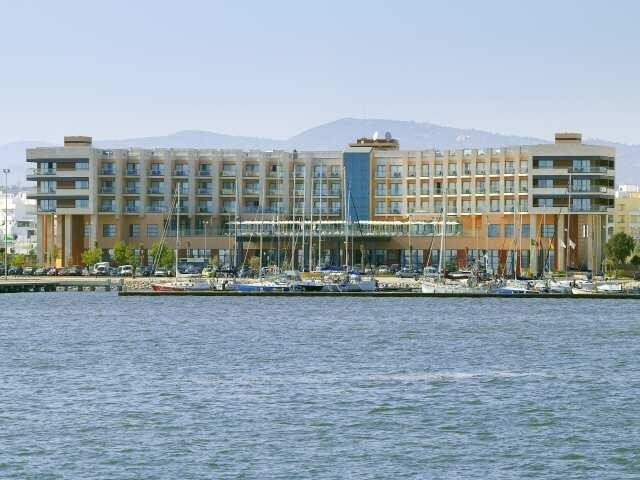 The Real Marina Residences Apartments are situated on the river front in a residential area of the town of Olhao. The modern holiday apartments are air-conditioned and are fully equipped with balconies with cable TV, direct dial phones and a deposit safety boxes. Real Marina Residences Apartments has a swimming pool on the roof for its guests whilst other facilities are to be found in the next-door Real Marina Hotel and Spa including a restaurant, bar, a Health Spa, massage and treatments, indoor and outdoor pools, a Business Centre, a sauna and steam baths and internet access. Regular ferries take visitors to the nearby Armona and Culatra Islands in a trip of about 15 minutes. There are three 18-hole golf courses within 15 minutes drive.